At first, people hated it. Now, nearly twenty years on, it’s become the iconic landmark that defines Auckland’s skyline. At 1076 feet at its tip, the Sky Tower is the tallest building in the southern hemisphere. It has restaurants, bars and cafes, and a casino where you can lose lots of cash. 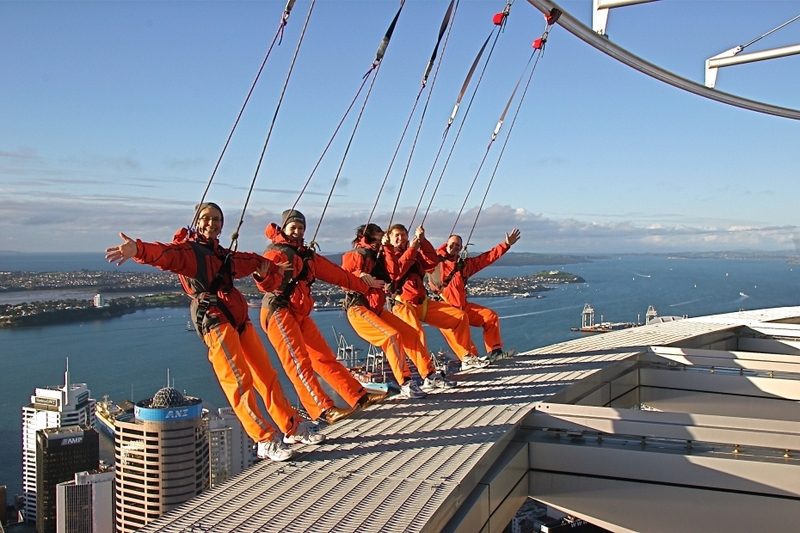 But before your wallet is empty, think about having a go at the Sky Tower’s two tests of bravery: SkyWalk and SkyJump. SkyWalk is the opportunity to walk around the narrow, no-rails pergola that circles the Tower 630 feet about the ground. The views are spectacular—if you open you eyes. Then, if you’re feeling down because you lost all that money in the slots, consider the SkyJump—hurling yourself off the Tower, base-jumping 630 feet at 52 mph. Don’t worry about flying off-course; you’re attached to a wire, and there’s a dime-size red bullseye you can aim for.